David Hardy was born April 1936 in Bournville, UK. After working in a laboratory and two years in the RAF he worked in the Design Office of Cadbury’s, where he created packaging art and catalogues for the company’s confectionery. However, in 1950 at the age of 14 he had already started painting space art. Joining the British Interplanetary Society he met the space artist R. A. Smith, who was one of his foremost influences, along with Chesley Bonestell from the USA and early French astronomer-artist, Lucien Rudaux. He also illustrated his first book – Suns, Myths and Men, with astronomer-author Patrick Moore – in 1954 at the age of only 18. Dave’s book with Moore, Futures, won the Hugo Award and the Sir Arthur Clarke Award in 2005, and he has been nominated several times for a Chesley. Dave’s first science fiction art was published in 1970, but he has gone on to illustrate hundreds of covers for books, and for magazines such as The Magazine of Fantasy and Science Fiction (F&SF) and Analog Science Fiction and Science Fact. He is known as much for his non-fiction, accurate astronomical paintings in the tradition of Smith and Bonestell, as for his SF work, in which he created ‘Bhen’, the famous green alien which lent humour to his vivid astronomical scenes and has appeared on a dozen issues of F&SF. He also has a published novel, Aurora (Wildside Press, 2013). He is European Vice President of the International Association of Astronomical Artists (IAAA), and a former Vice President of the ASFA. 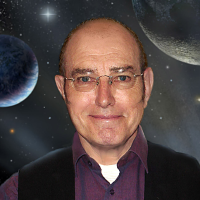 He usually exhibits his work in at least two SF conventions each year, including several in the USA and Europe, and has been Artist Guest of Honour at Eastercon, Novacon, Albacon, Stucon, Eurocon and several others. Dave is one of a handful of artists to have an asteroid named after him: in 2003 asteroid 1998 SB32 was christened Davidhardy; and in August 2015 he was awarded the American Astronautical Society’s Ordway Award ‘for Sustained Excellence in Spaceflight History’ in the category of Artist (the first to receive this).